Have you ever ended up with a RAR file that was password protected? Maybe you set the password yourself and forgot it! Whatever the case, there are a couple of ways to crack the password on a RAR file if you get lucky. Basically, there are two standard methods to cracking a password for any program: a dictionary attack or a brute-force attack. The first generates passwords using word lists from a dictionary and the latter simply searches all possible character combinations. Obviously, the latter is harder and will take more time. If the password is very complex and doesn’t have any recognizable dictionary word in it, it might simply be impossible. However, it’s always worth a try. For example, if the password is 5 characters or less, a brute-force attack will work. Anything longer than that will take months or years. Just remember, cracking a RAR password is not the same as cracking an Excel password, which is a lot easier. RAR files use AES encryption with 128-bit key length, something that can take too long unless you have a super computer. In addition, the file headers and file data are encrypted in a RAR file. In this article, I’ll list out a couple of software products that can possibly help crack a RAR file, free and paid. Depending on how important getting into the file is, it might be worth spending the money, but there is no guarantee you’ll be able to open the file. This is really the only freeware program out there for cracking an RAR file. It’s open source and supports version 2, 3 and 4 RAR versions. The only downside, and it’s a major one, is that the tool has to be used via the command line. If you’re oe the geekier side and are familiar with the command line, then you should definitely use this program to break a RAR password. The program uses extremely optimized code, which makes it the fastest RAR recovery tool. It’s also optimized for the latest x86 instructions on Intel Sandy Bridge and AMD Bulldozer processors. It aslo supports password recovery on NVIDIA and ATI GPU’s. Using a GPU in addition to a CPU can speed up the attack by ten to twenty fold. The site has a detailed manual that walks you through all the steps, but again, it’s a bit complicated. If you’re looking for a GUI interface and some extra features like multi-core support using multiple computers on the LAN, then you can check out Parallel Recovery, which is basically a company that licensed the cRARk code to create their own password recovery tools. Prices start at $41 and go up to $141 for the Professional version, which supports up to 8 CPUs and 8 GPUs. If you need to crack a hard password using brute-force, which is really your only option when it comes to RAR files, then this program is your best shot. The free trial will allow you to recover passwords up to 3 characters in length. If you have a longer password and the program is able to determine the entire password, you will see the 1st three characters followed by asterisks (*). In this case, you can buy the program for $30 and it will unmask all the characters. If it never shows the asterisks, that means it can’t figure out the password and you don’t have to buy it! Nice. If the RAR file is a version 2 RAR archive, you have a much better chance at cracking the encryption. If it’s a version 3 RAR file, you won’t be as lucky, especially if the password is complex. This is another program that uses both the brute force attack method and the dictionary attack. It’s shareware also, so the free trial has some limitations.What I like about RAR Password Cracker is that they have a couple of licensing options. If you’re only going to need this program once to crack a RAR password, which is probably the case for most people, then you can just buy a low-cost time-limited fully functional license for $7.5 (1 month) or $10 (2 months). The normal program costs $30, but these extra options are really useful and can save you money. The program works with RAR version 2.x and 3.x archives and supports self-extracting archives and multi-volume archives. As with the program mentioned above, you can pause the program at any time and restart it later and it will continue the attack from the same state, which is great in case the program crashes after running for 10 hours. Another good software for cracking into archive files like RAR and ZIP files is Advanced Archive Password Recovery, however, it’s pricey ($49 for Standard, $99 for Pro) and still probably won’t be able to crack a RAR archive that uses AES encryption with a strong password. This program is better if you know anything at all about the password like the length, whether special characters are used, the first or last letter, etc. You can plug those specifications into the program and greatly increase the speed of the attack. 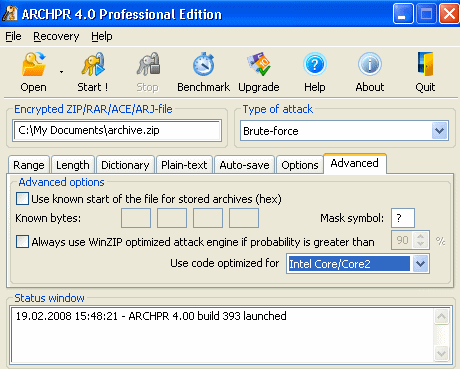 The program is better at cracking Winzip archives since those have weaker encryption. What’s cool about this program is that it can crack some passwords in less than an hour if the version of WinZip is below 8.0 by taking advantage of an exploit. The program also supports archive files over 4GB in size and includes the ability to pause and resume attacks. If nothing else above works, then you can consider this program. Unfortunately, those were all the semi-good RAR password crackers I could really find. Only one is free and it requires knowledge of the command line. Overall, you have a fairly low chance of actually being able to crack a RAR password, so bear that in mind. Enjoy!